Airbags were implemented in the 1970s, but it was not until the early 1990s that it became widely available in American cars. In fact, according to the SCDPS, more than 26,000 collisions reported involved airbag deployment and nearly 5,000 people suffered injuries despite their airbags deploying. Although this safety feature can protect victims, it can also lead to additional injuries and even death. Recently, poorly manufactured airbags have led to numerous motor vehicle recalls. Have been injured by an airbag that has either unexpected deployed or if it did not deploy at all during an accident? If you or someone you love has been injured by an airbag during an auto accident, the victim may be entitled to file a claim for damages. Our attorneys are knowledgeable in auto accident law and experienced in handling airbag injury claims. Call us at 1(888)821-0247 or fill out the Free Case Evaluation form to your right to get started on your airbag injury claim. 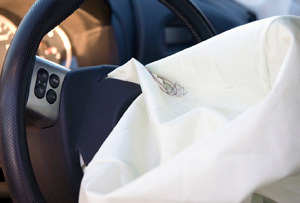 In 2007, the National Highway Traffic Safety Administration analyzed airbag-related fatalities and injuries that occurred between 1990 and 2007. Approximately 230 fatalities were related to airbag deployment and hundreds more injuries were reported. The number of airbag fatalities peaked between 1996 and 2001. Car accident victims suffering from asthma or other breathing problems could experience serious medical issues if an airbag deploys. Although the chemicals used for airbag deployment have changed over time, anyone riding in an older vehicle may be exposed to hazardous chemicals. In 2013, Toyota announced the recall of several models due to problems with the airbags installed; Takata Corporation was the supplier of these airbags. The NHTSA has launched an investigation into the manufacturer after six reports of airbag inflator ruptures were found. According to Takata, the airbag inflators blast the bags out with too much force which can then propel metal fragments toward vehicle occupants. Honda is aware of approximately two deaths related to these faulty airbags, while the NHTSA says it knows of six incidents of ruptured bags and three injuries. Many of the incidents have occurred in high humidity areas, such as South Carolina. Although faulty airbags can cause injuries, the sheer impact force of airbag deployment can also lead to serious injuries. When youre left with medical bills, cant work and are in pain you need someone who will stand up for your rights after an accident. Call us at 1(888)821-0247 or fill out the contact form at the top of this page to schedule your free case review today.